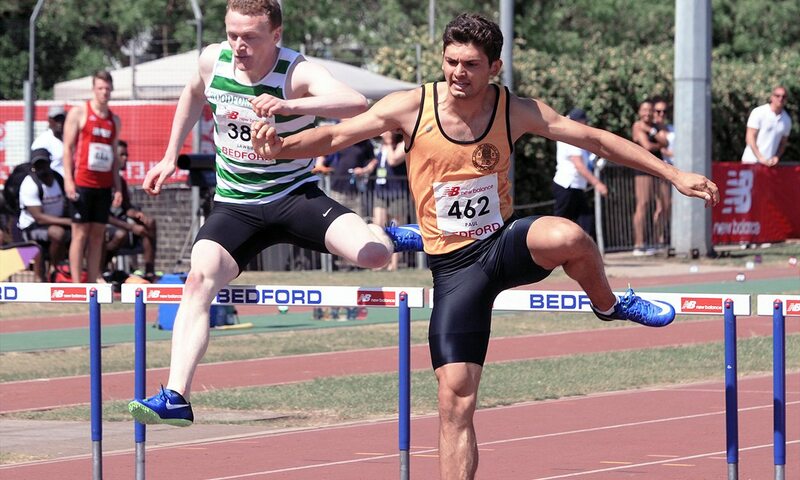 Jacob Paul had something of a breakthrough season last year when he clocked 49.49 for second in the UK rankings and finished fifth in the European Under-23 Championships. He spoke with John Shepherd to offer some insight into his training, nutrition and more. Athletics Weekly: So why the 400m hurdles? Jacob Paul: I ask myself that quite a lot especially at the end of a race or the end of a session! I started as a multi-eventer. I always liked to do all the events as a young athlete, and I think that it’s a good idea for young athletes to do as many events as possible. My best were the 400m and the sprint hurdles, so I put them together, and that’s what worked for me. AW: How tough is the 400m hurdles compared to the 400m flat? JP: To be honest I feel like I am always more tired… on the floor after a 400m flat, this is because the 400m is just gun to finish. However, with the 400m hurdles, it’s broken up into 10 different stages and you’ve got to be able to hurdle technically, so you can’t go off like a rocket and try to finish hard like you do in a 400m. You have to be able to hurdle the last hurdle, if you stutter into it or don’t take it very well that’s going to cost you a lot of time. AW: What’s your stride pattern? JP: Stride pattern is probably the most important aspect of the event. I need to get consistency, attacking the hurdles from the right position. I do 14 strides to hurdle 7 and then 15s from 5 to the finish. In 2016 I was trying to do 13 strides to hurdle 7… 13 strides is like that magical number, a lot of people think that the less strides you do the faster you are going to run, and that’s certainly what I had in mind. However, I was finishing the race a lot slower. So, last season with 14 strides, I got to hurdle 5 about a second down (compared to 13 strides – Ed), but I was finishing the race a whole second quicker. So overall my finishing time was about a half second quicker. Then I got to the point when my time to hurdle 5, using 14 strides, was half a second quicker anyway compared to when I tried 13. AW: So you have to hurdle off both legs? JP: I alternate legs each hurdle with 14 strides. The first hurdle I take with my left leg so I lean into the bend. If you’re leaning out, you bring your train leg through awkwardly and it’s not comfortable nor efficient for going over the hurdles. On the second bend I take one of the hurdles with my right leg but by then you are pretty fatigued, so I don’t think it’s quite so crucial (in terms of affecting the race), unlike the first hurdle when there’s more speed. AW: Does anything ever go wrong? JP: Yeah, definitely, you can turn up to a race and you’ve got a 5m/sec headwind down the back straight, so at each race I’ve got to have two or three stride patterns ready in my head, so that I have one that I can rely on. AW: So how to do you gauge which stride pattern to use? JP: I think it’s just experience more than anything else. I’ve been fairly fortunate in that I’m good at judging hurdles. I know that if I go over one hurdle and I’m stretching for it that I can then make the adjustment early for the next, as that’s when you are going to stutter and lose a lot of momentum. AW: How do you race 400m hurdles, if for example, someone goes out hard? JP: I think generally you go with the pace of the race. If there is someone who is a lot faster than you in the lane outside of you, it definitely helps in terms of using them as a marker… especially at the finish when you’re chasing and you are a lot more likely to try a bit harder. However, if you are in front the tendency is to not try so hard, to ease down a little. (Paul went on to talk about how paying too much attention, especially to the person in the lane outside of you, can throw you off your race and negatively affect your finishing time). AW: You dipped under 50 seconds in 2017, so it was a bit of a breakthrough year. What do you put that down to? JP: I think probably my mental attitude to the event and training has been the biggest factor in helping me run that sub-50. I also graduated from university in 2016 which has removed some of the pressures. (Paul now works as a personal trainer so he can devote more of his time and energies to his training). And also training back at home; training with my coach Marina Armstrong and my training group, which includes British junior record-holder Shona Richards, Chris McAlister, who made the British championships final last year, Tyri Donovan (52.81) and Orla Brothers (59.46). It’s good to train in a group where everyone’s striving for that same goal. Everyone is trying to break through to senior British international level. AW: And what about your nutrition? JP: When I was at university I didn’t have a good diet, I think the closest I got to a vegetable was an onion ring! Since then my diet has definitely improved and I believe my performance has because of that. Marina sends us diet plans which we try to stick to. AW: Do you stick to them? JP: Well, er … she sends us things which are quite extravagant, one time one of the meals that she wanted us to have was steak with Himalayan salt, or something like that, which was very specific. Not quite sure what the benefit of the Himalayan salt was but she keeps on top of the trends and diets. Sticking to a healthy diet is something that I have been criticised for in the past, so I like to think that I do now. I do believe that as well as following a strict healthy diet, you have to eat foods that you like and enjoy. AW: What do you eat before a race? JP: I try to eat some good carbs two-three hours before I race, before I warm-up. That will see me through until after the race. The last thing I want to be is hungry on the start-line. I begin my pre-race eating the day before… I will have pasta, which supplies a lot of carbs and some protein as well.